Ahh… Stephone Paige. A reliable target in the Kansas City Chiefs offense on Tecmo Super Bowl. When playing against an opponent determined to stop the Chiefs impressive ground game, you could always rely on Paige to be open for a deep bomb. Over the years, Stephone had some impressive cards that captured some of his greatest catches. From his Score 1990, where Paige is getting his jersey ripped off, to these two,-especially the Action Packed 1990 card, Paige was an artistic virtuoso at his position who was well known for his penchant for making one handed catches. If not for a turn-style at quarterback and a ground heavy offensive approach, who knows how Paige’s career would’ve turned out? Stephone completely embodies that type of underrated player that I like to get autographs from, especially when they write even the smallest note to me. Stephone Paige is another in a long list of wide receivers that saw prominence in the NFL during the 1980s. This list included: Stephen Baker (NYG), Henry Ellard (LAR), Gene Taylor (NE), Andre Alexander (Knights WLAF), and Dwight Pickens (Riders- WLAF). The link, is that these kids were all coached by Jim Sweeney at Fresno State- father of prolific Bulldogs quarterback Kevin Sweeney. Paige saw playing time at Fresno in 1981 and 1982. 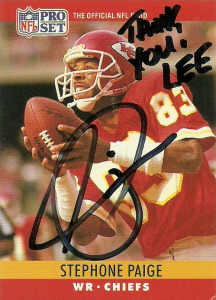 He really made an impact in ’82, a year that he piled up 48 receptions for 942 yards and 8 touchdowns. 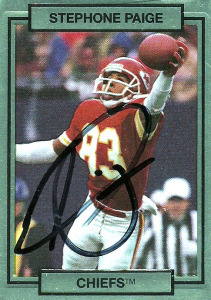 Going unnoticed in the 1983 NFL Draft, he joined the Chiefs as a free agent. Paige became an off the bench role player for KC early on. It wasn’t until his breakout year of 1985, when he led the NFL in yards per catch with a whopping 21.9 average on 43 receptions, that Paige finally got the credit he deserved. At that time, he also set an NFL record for most receiving yards in a game played in regulation with 309 yards against the Chargers (since surpassed by Calvin Johnson). From that season on, Paige was counted on to lead the Chiefs wide receiver corps. He’d continue to be an outside threat for the team, including a career high 11 TDs in 1986, and 65 receptions for 1,021 yards in 1990. Stephone however suffered a career ending knee injury during the 1991 season. While Paige’s final career numbers are modest, especially compared to today’s NFL pass happy offenses, he held the franchise record for most consecutive games with a catch (85), at the time of his retirement, which ranks his numbers among the best free agent wide receivers of all time.